A colleague asked me if I could gin up a graph showing relative carbon dioxide emissions for the US and Europe since 1990, with 1990 set to 1.0. 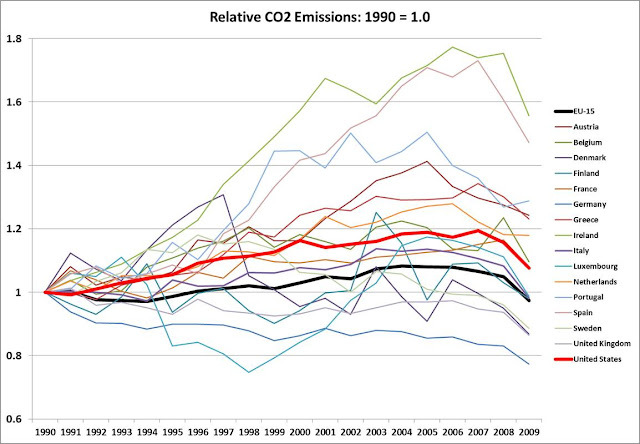 Here is that quickly-made graph; the data comes from the US EIA. In case you are curious, the European countries with relatively lower emissions in 2009 than the US (off of the 1990 baseline) are Germany, the UK, Denmark and Sweden. The picture looks different with a 2000 baseline.